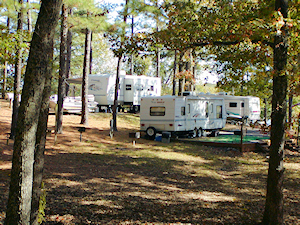 Wildcat Creek Campground is just minutes away from Murray, Kentucky. The town of Murray has a Super Walmart, Kroger, Lowes, JC Penney and many shopping boutiques. The town square is a fun place to spend an afternoon checking our the shops and restaurants. Visit Murray Main Street for the latest events. The Farmers Market is held on Saturdays in the summer and fall. Featured are local fruits, vegetables and crafts. Hazel, KY is just south of Murray is the antique capital of the south. You can spend the day antique shopping. Miller Memorial Golf Course is located just 5 minutes from the campground. There are many restaurants located in Murray, offering something for everyone. For a featured list, visit Murray, Ky's Restaurant Guide.